King Ridge Road is a narrow, twisty backroad without markings. From the Cazadero side, it's a very challenging 10 km climb to the top of the ridge. Instead of reaching a definitive summit, riders are rewarded with a fun roller coaster ride along the spine of the ridge with great views on either side and few signs of civilization. It's a very peaceful area and it's no wonder a Buddhist monastery exists nearby. (You can often find monks at the best cycling destinations around the world). The intersection with Tin Barn Road marks the north end for those doing the full route. Grandfondo riders will head back from the top end of the loop along a rolling sometimes difficult stretch of road where the name changes several times without any turn-offs. Most people know this section as Seaview Rd although there is no view of the sea (or the coast) until it turns into Meyers Grade Rd. And what a view it is. Thankfully, you'll be going down this road as it pitches up to 18%. It's so steep you have to crane your neck to get a view of the Highway 1 coastline. Hopefully, the fog doesn't impede your view, but don't be surprised if it does. The ride then traverses the hilly, coastline cliffs, south to Jenner where the ride joins up to the medio fondo route and continues down the coast, past picturesque Goat Rock State Beach before turning inland on Coleman Valley Road, a road used several times by the Amgen Tour of California. This is another short but steep climb that separates the men (pros) from the boys (amateurs). From the top, the road meanders through more ranch land before descending into Occidental. Occidental was one of the stops on the North Pacific Coast Railroad during the logging area and later brought vacationers from San Francisco. In the '60s, it was the center of the "neo-hippie" movement in Sonoma County. Today, "Occidental is unique for its high concentration of visionaries and famous artists" and supposedly its Italian restaurants. From Occidental, the Granfondo then heads back to Santa Rosa. 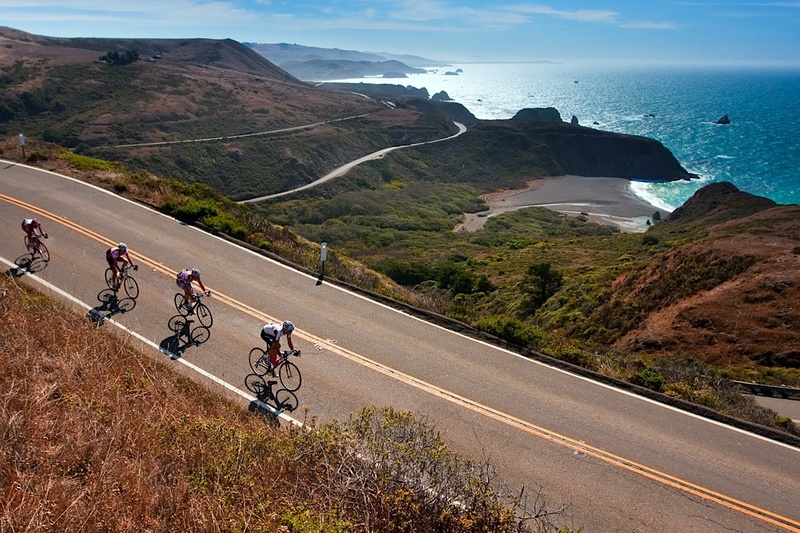 For logistical reasons, Levi's Granfondo starts and finishes in Santa Rosa, but if you are driving up from the San Francisco Bay Area on any other weekend then you are better off to start closer to the coast. Occidental, Bodega and Guerneville are popular spots if you are staying the weekend. Towns like Monte Rio and Duncan Mills are often used as a starting point for those just visiting for the day. 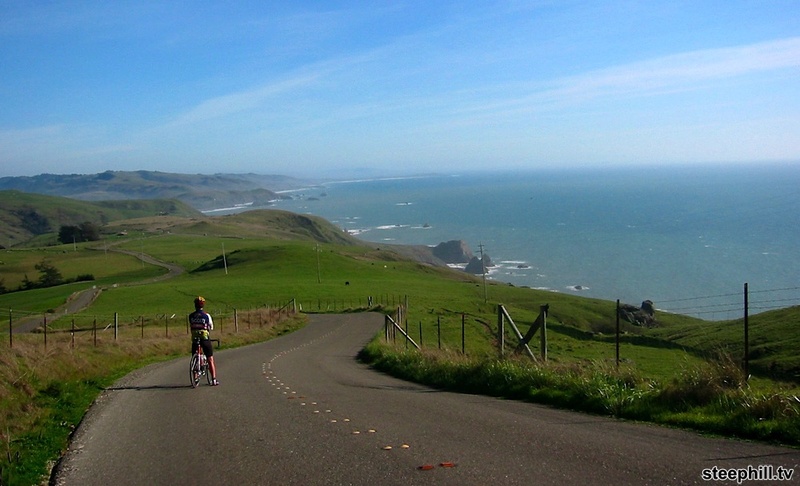 My favorite variation of this route (when I'm fit) incorporates the awe-inspiring Armstrong Redwoods Reserve and the steep finish to the Austin Creek Recreation Area where there is a good campground. The road to the Bullfrog Pond campground is so steep and twisty, you won't see any large camper vans (buses) at the top. Unfortunately, there are no showers either. Bring a portable Sun Shower or shower at one of the campgrounds off of the main road (Highway 116) or bring some Action Wipes.